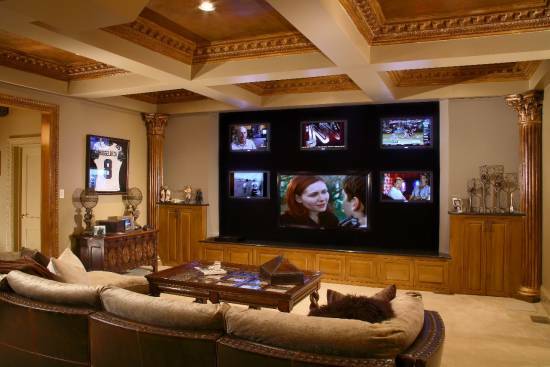 Have you always wanted to own a home theater that looked as grand as the 20 home theater designs showcased below? 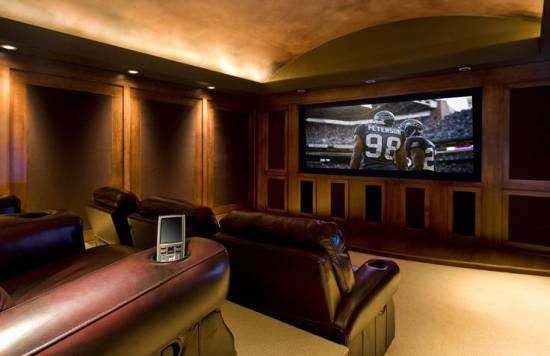 Well, if you want, you can choose any of these beautiful and stunning home theater ideas that have been handpicked for you all. 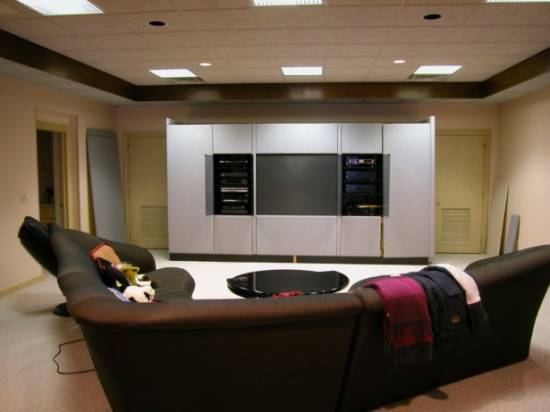 Home theater designs are varied and you may end up getting confused. Hence, go through this post to see which design idea suits your style and budget before selecting one for your house. 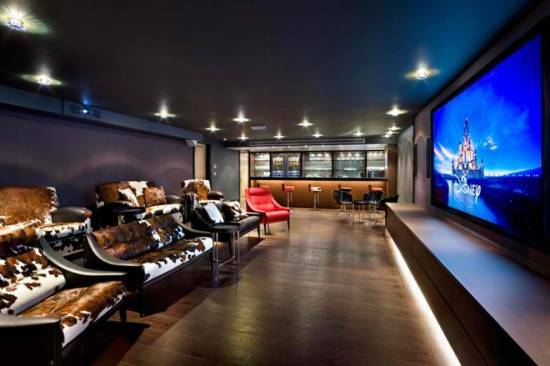 Take a look at these stunning home theater designs, pictures of which will get you inspired! The home theater design as seen here looks quite chic with chunky leather sofas in brown shade. To complement its beauty, there are fitted spot light fixtures on the ceiling and a large screen for a great viewing experience. The brown color palette looks warm and very rich. Below is shown a chic looking home theater where the décor has been accentuated using a whole lot of animal prints on the modern looking couches. There is a huge bar area that looks trendy too. The wooden flooring complements the look. 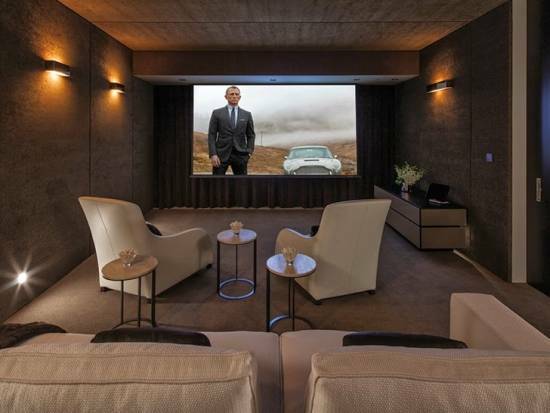 Masculine elements like the use of leather couches and an overall brown theme used throughout adds a modern touch to this amazing home theater as seen below. The screen is paneled with wood and looks huge. 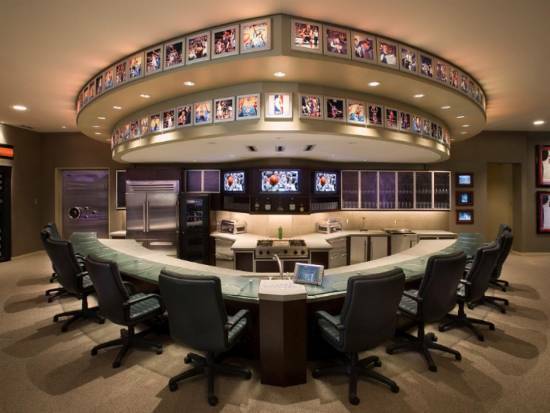 Purple shade adds a glint of style like no other color does and this is quite evident from the picture below that shows a home theater where the roof lighting emanates purple glow and the borders of the ceiling are painted in bright deep purple shade. 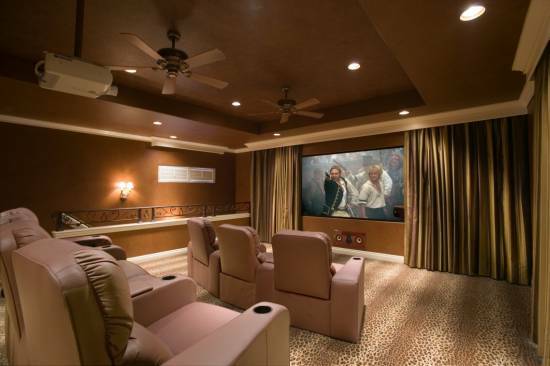 This home theater room looks gorgeously beautiful with a high ceiling that has been decorated with acoustical panels and contemporary settings. The use of brown and red accents in the décor adds to its chicness. There is a trendy looking fireplace built just under the projector screen. With rich brown leather sofas that offer comfy seating, and a floor to floor carpeting done, the home theater looks stunning and very modern. There is a separate seating with a wooden table and comfy chairs. 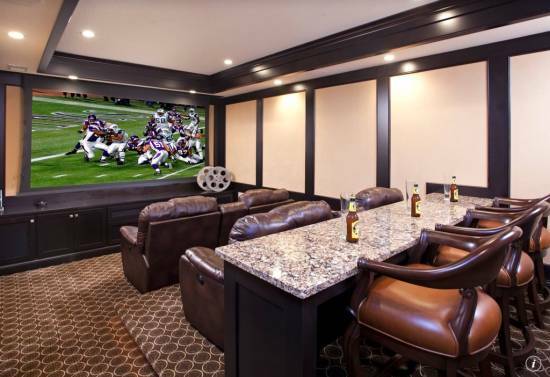 The home theater seen here is simply gorgeous as it has been equipped with a bar, a kitchen, 20 or more plasma televisions, bath areas and LCD Displays. 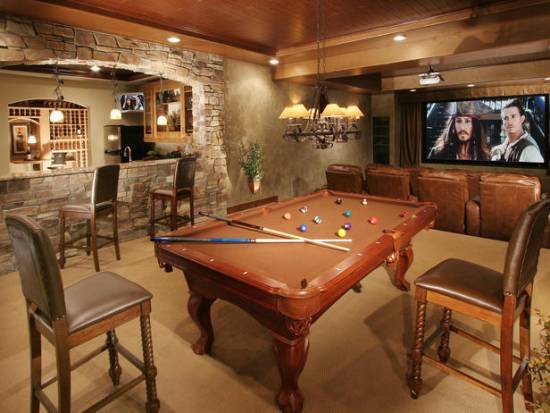 There is a pool table placed right behind the seating area of this home theater that looks very masculine with brown being the central theme here. There is a kitchen whose facade is made of stone and the wooden ceiling that matches well with the brown decor. White looks good with any color and in the image, we see it gelling very well with brown splashed all across. While white is seen on the modern couches, brown palette has been used on the walls, floor and ceiling. 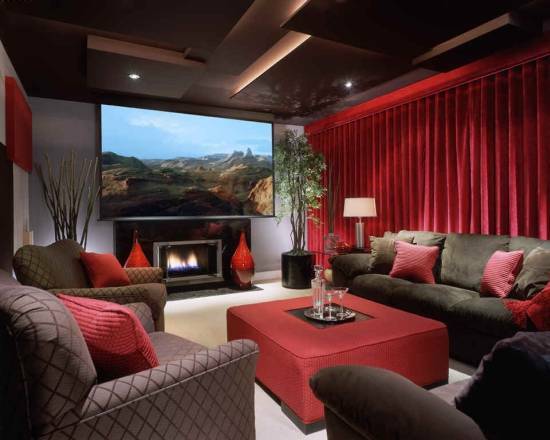 In this home theater, the designer has used ample amounts of red color on the walls to lend it a rich appearance. The rich look of the walls get enhanced with wainscoting done in black and the use of diffused lighting all over the room. 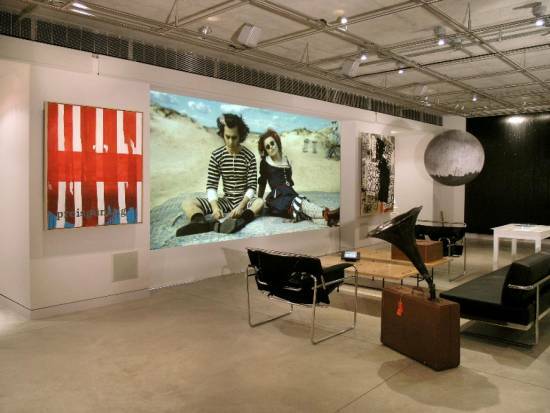 The home theater design in the image looks more like an art gallery with stunning art pieces installed everywhere. The multimedia screen is huge and is retractable. In addition, there are plasma screens that drop and a smart seating area. 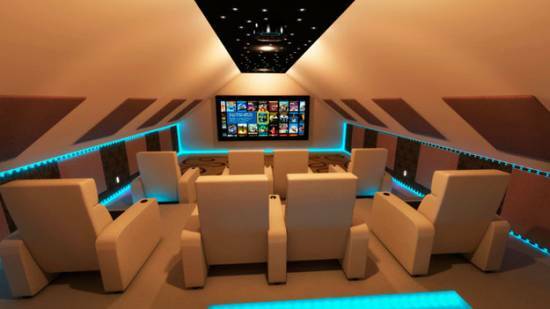 The futuristic designs are very much in demand these days and the home theater seen below has been designed keeping futuristic theme in mind. The use of blue lighting all over coupled with the design of the walls and ceiling lend a feeling as if you are sitting inside a space craft. 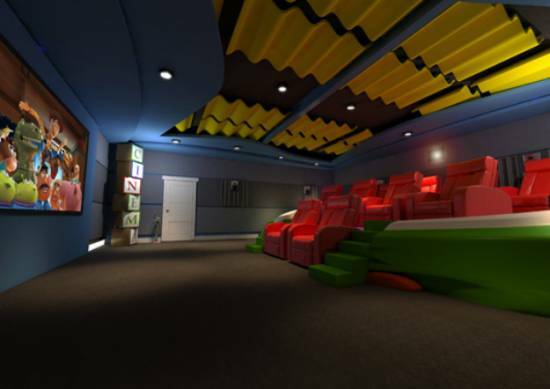 The home theater seen in the image below has been designed on the lines of a play room meant for toddlers. With bright colors used like red, green and yellow, the media room looks like a play zone for having some fun. White and brown match perfectly to create a contrasting effect in this fabulously decorated home theater where the ceiling has been fitted with bright light fixtures; the wall has been plastered with a sleek looking wall unit and a comfy seating place. 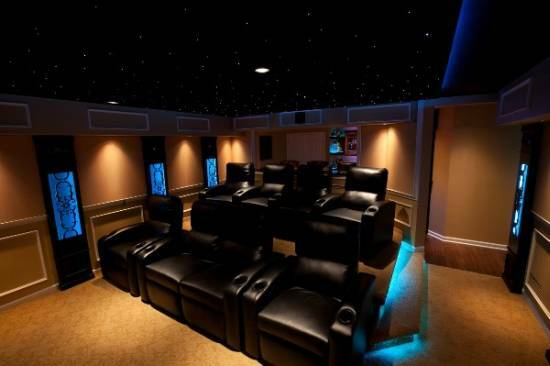 The home theater in the image is small in area and has been decorated on futuristic lines with the ceiling designed to give a feel of an open sky. One can see light fixtures fitted on the flooring, on the roof and on the wood panels plastered on the walls that lend a very stylish touch to the décor. 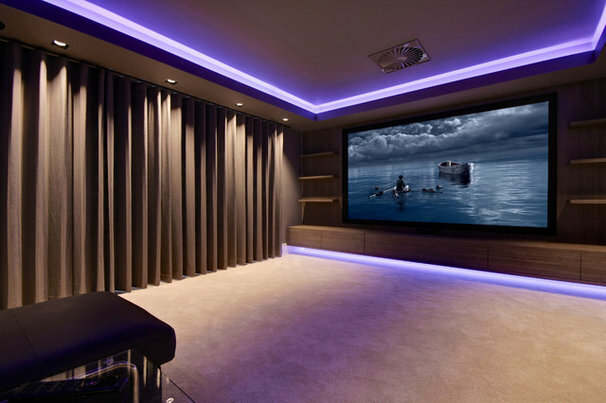 This home theater looks classy with a large projector screen and silken, free flowing draperies that lend an ethereal touch to the décor. The chunky couches look trendy and offer a good contrast to the fans plastered on the ceiling that look traditional. Red, black and brown go very well as far as interiors of a house are concerned. The red loveseats installed behind the black leather couches add style and warmth to the rich décor. Lamp fittings can be seen on the side walls. 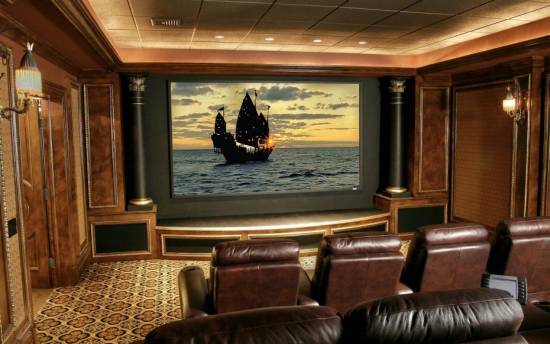 Traditional décor looks amazing such as in the image where the home theater has been designed on traditional lines with ornate wooden ceiling, carved pillars and traditional furniture placed through out. The wall unit below the screen looks grand too. Though, the décor of this home theater is simple, yet it looks very elegant with a brown wooden cabinet installed to house the large television and racks to store books. The eclectic mix of red, white and beige accents seen splashed inside the theater add to its grandeur. The wall behind the projector and on its sides is painted in white that looks serene against the backdrop of bright red curtains falling smoothly. The brown and beige couches too look chic. 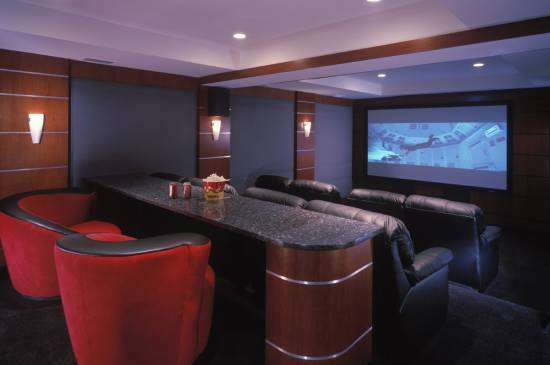 Home theaters are much in demand these days and people do not mind spending lavishly on designing them. 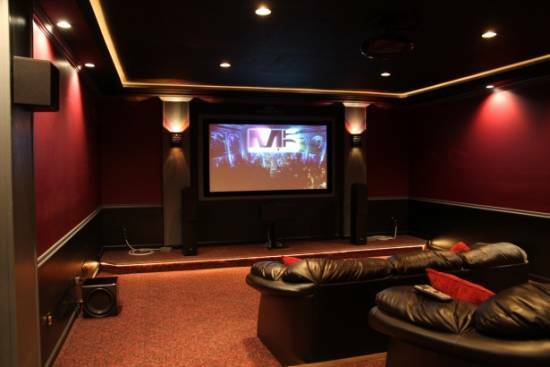 Among a plethora of home theater designs, pictures showing stunning theaters have been put up for you to see which home theater ideas suit you best. Come back with your comments if you wish. Happy viewing! 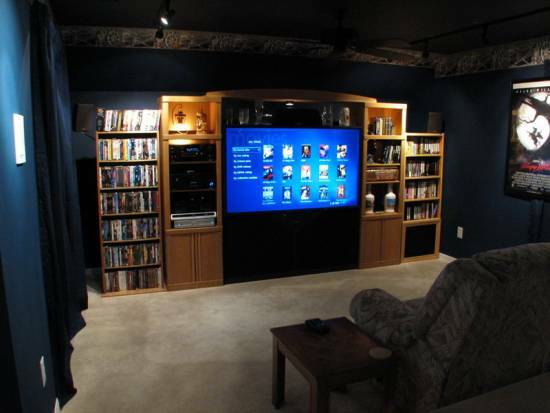 Thanks for giving informative tips for Home Theater Installation and Home Cinema Installation.